Every good marketer knows that premium brands must deliver more than premium products in order to attract customers. High quality, high priced brands must satisfy customers on an experiential level as well, and this process begins long before shoppers part with their cash. With the world of e-retail expanding rapidly, it’s more important than ever before for brands to take the in-store experience to another level. According to Rohit Arora, Strategic Planning Director of Bates Pan Gulf (BPG Group), the retail branded environment in high-end branding is all about heightening the consumer’s brand experience and amplifying the brand aura. Indeed, whether or not your business has an online presence, the brick-and-mortar store should serve as an arena to showcase the superiority of your products and invoke an emotional response in your target market with the aim of driving sales. So, how can premium brands ensure that their products make the grade in-store? A critical review of store environment on shopping behaviours carried out by Shun Yin Lam at the University of Hong Kong found that shoppers can be highly influenced by visual information, such as window, merchandising and point of sale displays. A range of other environmental factors, such as lighting, colour, music and scent, has also been shown to impact on shopper decision-making. Using real-life examples, this blog will focus on displays and lighting – two components which can be crucial to reinforcing brand culture and increasing sales. How products are displayed in stores can have a marked effect on how shoppers interact with them. Often overlooked, the furniture that is used to exhibit goods can play a major role in how shoppers perceive brands. Retailers looking to boost the sale of premium brand products should aim to create inspirational and visually stimulating sales displays that reflect the look, feel and culture of their brands and allows passersby to interact with products easily. This tactic was recently implemented by Boots, which introduced a new look for its 2014 Christmas gift selection in 317 stores. The campaign, which was project managed and installed by CJ Retail Solutions, included premium display towers and floor standing display units that seek to emphasise quality over quantity. The high-end visual appearance of the brands on display extends beyond the products themselves through the design of the display furniture, which is emblazoned with recognisable brand imagery. The store took the decision to use furniture which housed low levels of stock in order to create a feeling of luxury and exclusivity. It is common knowledge that lighting can affect mood. Many consumers may not be aware, however, that the intensity and location of lights in the retail space can be manipulated to affect shopper behaviour. A number of studies have been conducted that suggest that lighting influences sales performance, including one by Cuttle and Brandston (1995) which looked at the relationship between light and profit in two furniture stores. After replacing traditional lighting with energy-efficient solutions and substituting filament spotlights and fluorescent and halogen lamps with ambient and accent lighting, they found that that the energy cost had fallen by 25% and sales had risen by 35% in one store. According to the Illuminating Engineering Society of North America, retail lighting can serve more than one purpose, and should be used to reflect a store’s image, showcase products and attract shoppers. When it comes to marketing premium brands, image is all-important. Abercrombie and Fitch subsidiary, Hollister, is almost as well known for its unique approach to lighting design in its stores as it is for its clothing. 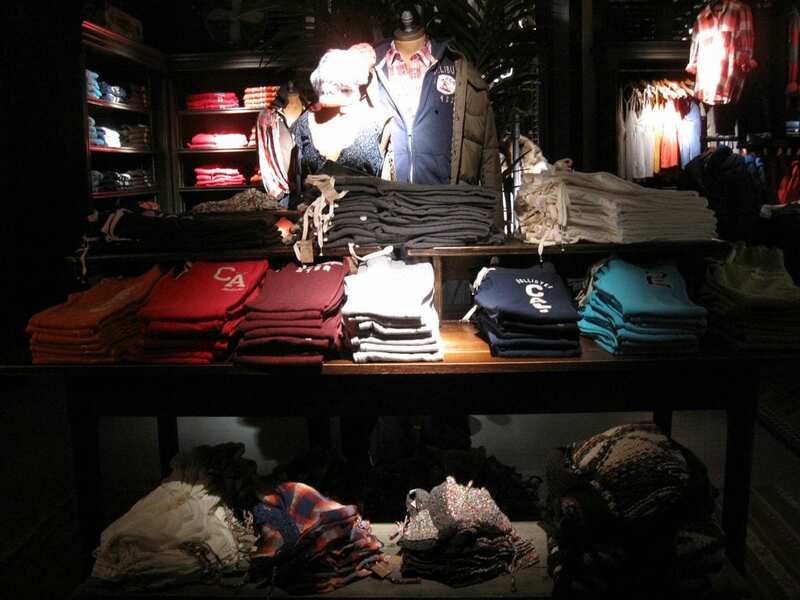 The high-end casual fashion brand, which is popular among teenagers, achieves a nightclub-like atmosphere by using dimly-lit spotlights to highlight products. Combined with music played at high volumes, the mood created is reflective of the brand’s effortlessly cool image. Remember, there are many other factors to consider when it comes to promoting premium goods in a retail environment, but getting displays and lighting should be high priority considerations if a brand is to be successful in-store. Tagged design, Hong Kong, Rohit Arora. Bookmark the permalink.